Thousands of diesel VW and Audi models are being stored at sites including this former stadium north of Detroit. WASHINGTON -- Volkswagen Group is making progress settling U.S. legal claims from its emission-cheating scandal, but one challenge looms unresolved: What to do with the hundreds of thousands of diesel cars it is being forced to buy back. The automaker agreed last year to buy back about 500,000 diesels that it rigged to pass U.S. emissions tests if it can't figure out a way to fix them. Except for a handful of 2015 models, VW dealers can't sell the cars until the company comes up with repairs to satisfy regulators. In the meantime, the company is hauling them to storage lots, such as ones at an abandoned NFL stadium outside Detroit, the Port of Baltimore and a decommissioned Air Force base in California. The automaker sold half a million diesel vehicles in the U.S. with software that activated stronger emissions controls during government lab tests but were inactive in the real world, when nitrogen oxide emissions surged to as much as 40 percent above legal limits. Six VW executives have been indicted and the company has set aside nearly $24 billion (22.5 billion euros) to cover cheat-related costs, including more than $10 billion to buy back vehicles in the U.S. A second buyback of around 20,000 3.0-liter diesel cars is expected to start in the coming months. About 15,000 VW owners are showing up at dealerships each week now to sell their Jettas, Golfs, Passats, Beetles and Audi A3s to the carmaker in exchange for payments of as much as $40,000. The agreement dictates that the cars can't be put back on the road without being brought into environmental compliance, something that is almost certainly impractical for most of them. Even exporting them to countries with lesser emissions standards is forbidden. In all, around 288,000 owners or lessees had opted for a buyback or early lease termination as of Feb. 18, of which 138,000 had been completed, according to the latest update filed with a court overseeing the settlement. Another 52,000 owners have said they want to keep their cars and are awaiting a fix. Depending on the model, it could be a long wait. Regulators are reviewing repair proposals from the company, but the only cleared remedy applies to about 67,000 diesels from model year 2015 that the company recently won approval to market. They are equipped with the latest version of VW's diesel engine technology and will be fixed in two phases: a software update available now and hardware retrofits when parts become available early next year. John German, senior fellow at the International Council on Clean Transportation, says that's a troubling sign for the hundreds of thousands of other diesels. The 2015 technology "will be the easiest to fix because it's the most recent design and it has the most modern emission control system, but even on that one, VW has to replace the entire after-treatment system and the particulate filter," he said, referring to components of the exhaust system. "If they have to do that, what's it going to take for 'Generation One?'" There are around 325,000 "Generation One" diesel VWs from the 2009-2014 model years, which use what's known as a "lean NOx trap," an older technology designed to capture and scrub away pollutants. German says it's unclear whether a more robust lean NOx trap will hold up to durability tests required by regulators, who have also insisted that any repair not diminish the performance of the cars the owners expected when they bought them. VW could theoretically seek to retrofit the older cars with a "selective catalytic reduction system" that sprays a urea-based solution into a special catalyst in the exhaust system, causing a chemical reaction that cleans the pollutants. But that retrofit presents a host of engineering challenges, German said. For example, engineers will have to shoehorn a urea tank and filling nozzle into small cars never designed to accommodate them. That may prove too costly for a used car. "No matter what VW does, the 'Generation Ones' are going to be far more difficult to fix," said German, whose organization commissioned the West Virginia University study that first discovered VW's excess diesel emissions. "Anything's possible, but if the costs [of repairs] exceed the costs of just scrapping the vehicle, especially on the older ones where the values are so low, VW might just scrap them." VW spokeswoman Jeannine Ginivan said the program is "an important part of Volkswagen's efforts to make things right for our customers and rebuild trust in the United States." She said the company has been encouraged by the customer response. "The program is unprecedented in terms of its size and scope and we have devoted significant resources and personnel to help ensure that it is carried out as seamlessly as possible," she said in an email. Even with an EPA-approved repair, dealers expect many high-mileage, older diesels from 2009 and 2010 in poor condition to be scrapped. "They've determined that there's a threshold where it's going to be more cost effective to junk," said Fred Emich, general manager of Emich Volkswagen in Denver. But receiving any used diesels would be "huge," Emich said. "Where we're feeling it the most is service," he said. "They've taken about 200,000 cars off the road at this point, and those were all old cars that were good for service business." In the meantime, the buybacks will continue as the clock ticks toward a key date: June 30, 2019. That's the deadline for VW to buy back or repair at least 85 percent of the 2.0-liter diesels, under the terms of a court-approved settlement with regulators. Falling short would mean the company must pay the U.S. Environmental Protection Agency $85 million for each percentage point below that threshold, plus $13.5 million to the California Air Resources Board for each percentage point shortfall in the state. That helps explain the massive operation VW has erected to handle the buybacks. 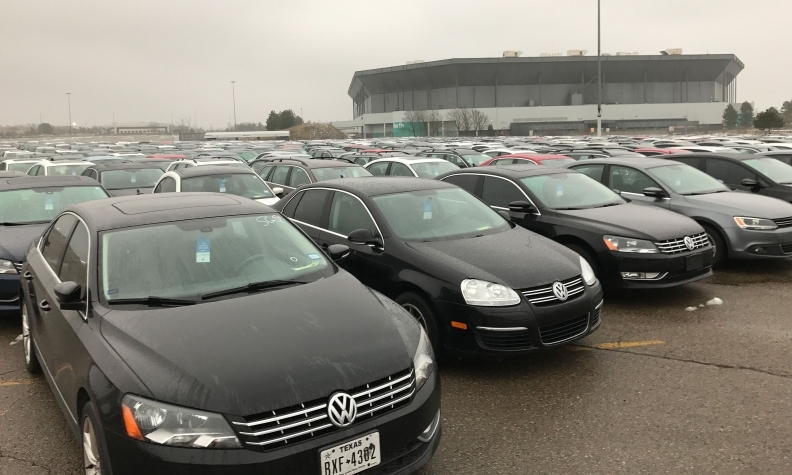 The company has hired around 1,300 contractors, including "settlement specialists" placed at VW and Audi dealerships, who cut buyback checks ranging from $12,500 for a 2009 Jetta to more than $40,000 for a 2015 Audi A3 TDI. "The public doesn't realize the monumental undertaking that they've pulled off to do this in a year and a half," said Matthew Welch, general manager of Auburn Volkswagen near Seattle. "Nothing like this has ever been done."